How did you first get involved in art? I was probably always going to do something creative with my hands. While my sister was curing the illnesses of our dolls with her doctor’s kit, I was busy tearing down the old coal bin to build myself a house, painting everything in sight with house paint that I found in the cellar, and raiding my mother’s rag bag to sew costumes for the variety shows I presented in the cellar. As I was also studying piano from the age of seven, it wasn’t until my senior year in high school that I made the conscious decision to be an artist instead of a musician. What is your academic history? Do you have any art-training? I was fortunate to spend three middle school years in a private school that had a wonderful art department. We were allowed to go to the art studios any time we wished. Back in public school, I was on the art board of our high school publication and also received a completion certificate for a correspondence course in commercial art. I graduated from Rhode Island School of Design with a BFA in Illustration and a minor in graphics, after which I worked in the bull pen of Doubleday Publishing in New York City and as an assistant to the art director of Chanticleer Press, also in New York City. I was then offered a work scholarship at the Pratt Institute Graphic Art Center doing etching and intaglio prints after which I was accepted in the most unusual way into the Max Beckman Scholarship Program at the Brooklyn Museum Art School where I spent two years in graduate painting under Reuben Tam and Mark Samenfeld. What was the "most unusual way" that you received the Max Beckman Scholarship? After the work scholarship at Pratt Institute’s Graphics Art Workshop in Manhattan, I was working in a very drafty attic. My neighbor in the attic was the author Taylor Morris. Tar would drip from the roof onto my palette in summer, and it was freezing in winter. It had no bathroom and I had to go down four flights of stairs to use the restroom. The wind literally blew me and my canvases into the museum. The director of the school, a kind man whose name escapes me now, agreed to look at my work. He seemed to be very taken by it and he put me into the Max Beckman program, as well as the morning classes at the school. I never applied for the Max Beckman scholarship. It was never officially recorded. This director just gave it to me, like that. I was allowed to stay there for two years, even though it was only a one-year program. I worked side-by-side with recipients of the scholarship from all around the world under the tutelage of Reuben Tam, a successful Hawaiian painter who was represented in New York City. The morning program was taught by the painter Mark Samenfeld. It was a changing point in my life and a fantastic learning experience. Not only was I side-by-side with wonderful talent, but I was in the museum and could wander around at will. Our particular class, the first year, was so successful that the Brooklyn Museum gave us an exhibition in the museum itself entitled “Eighteen Young Artists." Additionally, the museum is located right next to the beautiful Brooklyn Botanical Gardens and also the main Brooklyn Public Library. I could walk in the gardens for inspiration - an unbelievable experience in the snow. I could have books brought up from the stacks at the Brooklyn library, which has an extensive collection of beautiful art books that they don’t have room for on the shelves. I made friends with another artist from Kansas who, after we left the Brooklyn Museum School, arranged for me to have my first one-man show in Fort Hays Kansas State College. And that’s the unusual way I was accepted into the Max Beckman Scholarship Program. 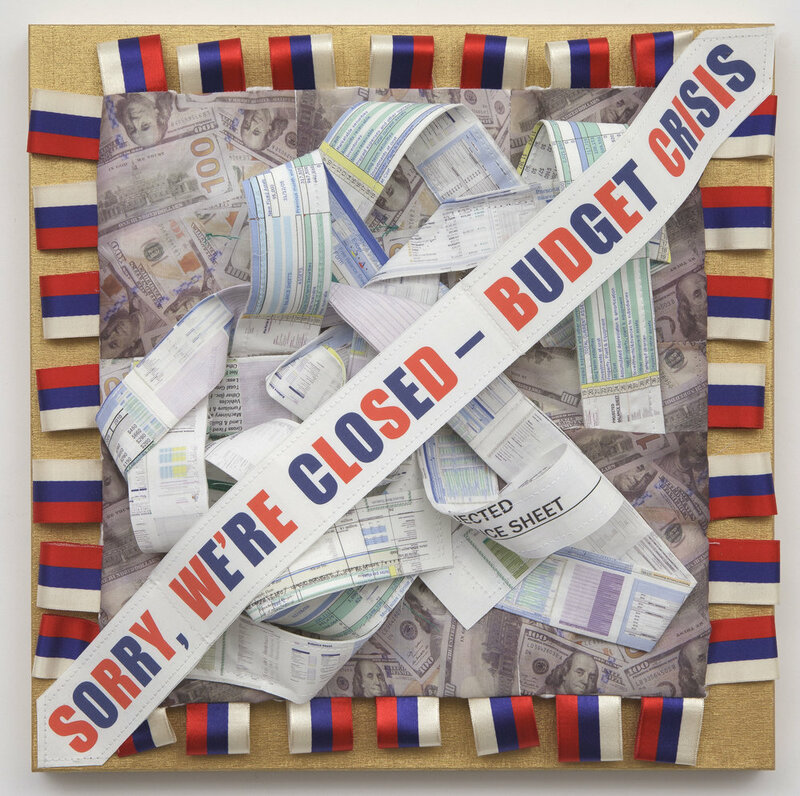 By the way, that trust fund eventually ran out and the school eventually closed. The space where we had our classrooms is now exhibition space. Sometimes I go over there just to remember those days. All that is recognizable now is the decorative iron staircase. All the huge windows that lit the art studios are now covered to create walls for exhibition space. Where & from whom do you draw inspiration? It was an exhibition of fiber art at MOMA that precipitated a switch from painting to fiber and, in my case, to rope. It was a gradual evolution which involved my trying to incorporate my music into my art, first with thread on vellum, then string on canvas and then clothesline rope. My own personal form of music notation was the inspiration for huge hanging works using rope, which I painted by hand and inserted into the canvas. This gradually evolved into freely hanging clouds, as I called them, which finally became dismantled and twisted into rope sculptures. Words had long been a part of my work, and I became more and more aware of my need to speak up about events around me that were truly disturbing and about which no one else seemed to care: a college student disappearing on her way to college and never found, an AIDS victim refused a funeral by his disapproving parents, toxic fumes coming from a polluted river, birds dying from eating plastic, a young boy in the projects being shot because he was playing with a cork gun. I began to realize that by bearing witness with my art I could possibly enact social change. If nothing else, I could create awareness. This has now become my most driving force. Along the way, I have taken encouragement and inspiration from artists such as Nathalie Miebach, Eva Hesse, Arshile Gorky, Julie Mehretu, Sheila Hicks, Francoise Grossen, and El Anatsui. Boston Tides by Nathalie Miebach, 2006. San Mateo by Francoise Grossen, 1981. Message With Texture, Sheila Hicks, 2015. In your award-winning piece Trail of Tears / The Long Walk, why did you decide to utilize the colors that you did? Before I started the actual physical work on Trail of Tears/The Long Walk, I did extensive research on American Indian clothing, jewelry, and head dresses. The colors that I used, as well as the use of feathers and beads, were based on that research. The use of the teardrop beads is self-explanatory, given the subject of the piece. The text was originally printed on white fabric. The white fabric was too bright so I decided to stain it with a wash of burnt sienna that it would look old and worn and the color of earth. What is your connection with the Foundry Art Centre? I have been involved with the Foundry Art Centre since 2010 having had work in FIBER:TWENTY TEN in 2010, Fiber Fever in 2014, and now Soapbox in 2016. I am currently working on several different things, some smaller works using music notation and painted string on canvas and on paper, and a rope sculpture with digitally-printed text dealing with the lead-contaminated water tragedy in Flint, Michigan. How do you connect with people through your art? Why do you create art? When you are not at work in your studio, what do you enjoy doing? My studio seems to extend beyond the walls. I might be in the yard or in the cellar, in the kitchen or on a ship. You might find me working in any of these places. I regularly attend the opera and the ballet. I love movies and theater. I meet weekly with a group in order to converse in Italian. We discuss recent events and Italian literature. I am also very involved with The Textile Study Group of New York, am on their board of directors and am the curator of their online members’ gallery. Besides networking with a supportive group of fiber artists, we have monthly lectures and presentations by prominent artists in the field. Living in New York City, I have a wealth of museums and galleries at my fingertips. I love to travel, visit new places and learn about other cultures. Most of all, I love being with my huge family. To learn more about Elaine Longtemps' work, please visit her website, elainelongtemps.com. Elaine's award-winning artwork will be on display in Gallery I of the Foundry Art Centre through November 11, 2016 as part of our juried exhibition, Soapbox. 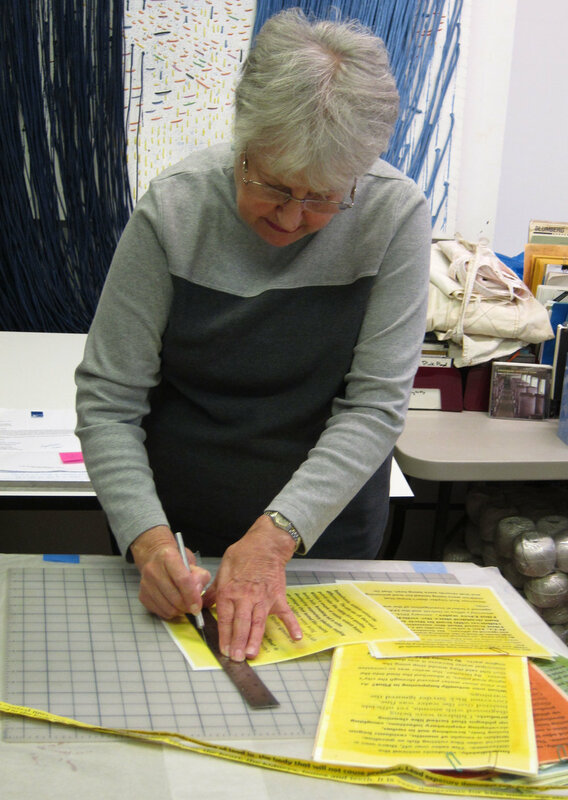 Elaine Longtemps cutting fabric strips for new work. 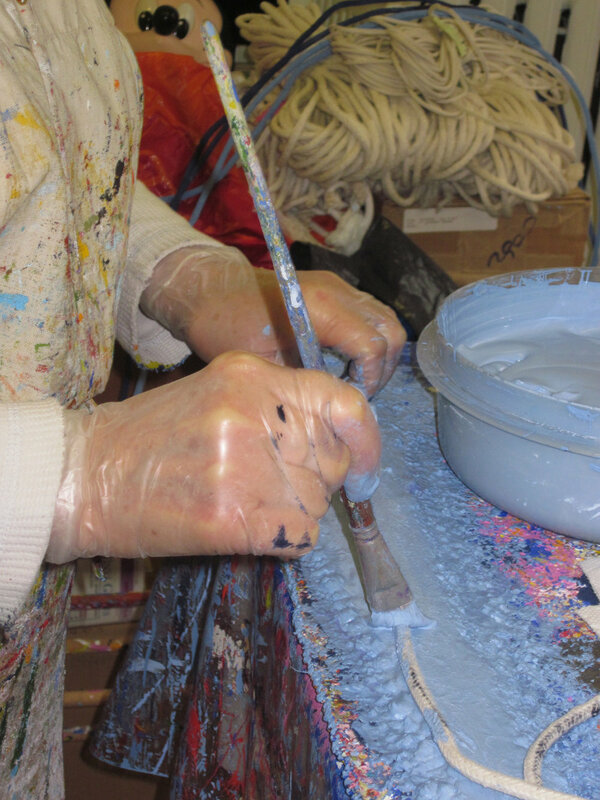 Painting the rope for artwork entitled Stardust. Stardust For Twenty Angels in progress. Painting ropes for Fracking America. Detail of text for Fracking America. Detail of text in No One Is Listening.